8 PCIe Platform PCI Express is the standard platform for all current PC-based systems and also for the future. Today’s state-of-the-art motherboards normally have a couple of PCI Express slots but only one or two PCI/PCI-X slots. The PCI Express bus is a point to point connection allowing full speed for every single slot. The Express bus is freely scaling and is available with 1 lane (x1), 4 lanes (x4), 8 lanes (x8) and 16 lanes (x16). For mechanical compatibility connectors may have more lanes than are connected to the motherboard. M4i PCI Express Platform M2p PCI Express Platform PCIe x8 Gen2 Interface PCIe x4 Gen1 Interface more than 3.0 GByte/s streaming rate more than 600 MByte/s streaming rate Star-Hub for internal synchronization up to 8 cards Star-Hub for internal synchronization up to 16 cards 3/4 length (243 mm) single-slot card ½ length (168 mm) single-slot PCIe card SMA and MMCX connections SMB and MMCX connections SCAPP option for CUDA-based calculations SCAPP option for CUDA-based calculations Advantages of the PCIe platform Universal bus system incorporated into millions of commercial and industrial systems world-wide Scalable PC platform from low-cost, low-end up to high-performance, multi-processor, multi-core Wide choice of components like ultra-low noise power supplies, additional interface cards or high-performance graphics cards Very fast backplane (PCIe lanes) – capable of very fast streaming to SSD arrays Direct interconnection with GPU for data processing possible (SCAPP option) Easy system extension via wide choice of PCIe extension components Outstanding Continuous Streaming Speed The fast PCI Express interface of the Spectrum cards together with the optimized firmware and kernel driver allows a sustained acquisition streaming speed between card and PC. The on-board memory is completely used as a FIFO buffer to ensure the maximum throughput over a long time even with parallel PC activities. This outstanding streaming speed together with the intelligent memory segmentation modes fulfills even the most demanding application needs. The M4i series is using PCIe x8 Gen2 interface with more than 3 GByte/s reaching 3.4 GByte/s on selected motherboards. A gap free streaming of for example one channel 8 bit acquisition with 2.5 GS/s or four channels 14 bit acquisition 400 MS/s is easy to achieve. Using a SSD RAID 0 array with a dedicated RAID controller one can even store this amount of data continuously to disk array. Option Synchronization Star-Hub The Star-Hub is an additional module allowing the phase stable synchronization of up to 16 boards (M2p series) or up to 8 boards (M4i series). Independent of the number of boards there is no phase delay between all channels. As a result all connected boards are running with the same clock and the same trigger. Each board is internally connected with a small cable of the same length, even the master board. That minimizes the clock skew between the different boards. On the M2p series the Star-Hub allows the synchronization of various cards when running with different sampling rates. This allows a mix of slow and fast sampling in one system whilst still preserving the phase relation between the different channels. 10 Ethernet Platform .................................................................... digitizerNETBOX generatorNETBOX The digitizerNETBOX / generatorNETBOX is a remote solution that is connected by Ethernet using the LXI standard. The device can be used as bench-top instrument directly connected to a laptop or desktop PC or as 19" instrument connected to the company LAN and accessible from anywhere. Complete portable instrument solution Connect directly to your PC or Laptop or anywhere in the company LAN BNC (< 125 MS/s) or SMA (> 125 MS/s) connectors SBench 6 Professional software license included 19“ and DC power supply options available Mobile or service Shared instrument on desktop Remote Instrument in a LAN DN2 Series Small and portable LXI/Ethernet Up to 16 analog channels with either device with up to 16 channels BNC or SMA connectors. 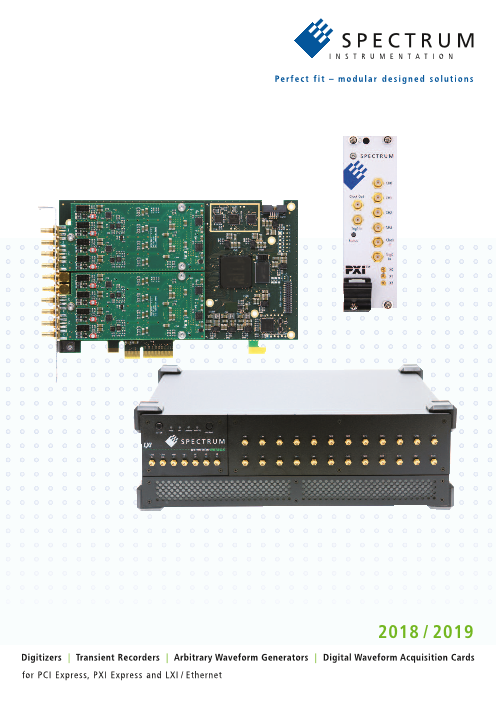 Full analog interface with programmable ranges, termination and offset available Each LXI device from Spectrum offers several interconnections with other instruments. Be it trigger or clock input and output, universal I/O lines or a timestamp reference clock input. The handle, the stackable bumpers, the light weight of only 6 kg and the optional internal DC power supply make it possible to use the DN2 devices for mobile applications, service jobs or for mechanical inte- gration into custom systems. 19“ rack mount kit available as an option LXI eXtensions for Instrumentation The digitizerNETBOX / generatorNETBOX is a fully compliant LXI instrument that is able to show the status of the box along with the current acquisition / generation information. It offers an IVI compatible interface for the IVI digitizer, IVI scope and IVI FGen classes. LAN eXtensions for Instrumentation (LXI) is a standard developed by the LXI Consortium, an industry consortium that maintains the LXI specification, promotes the LXI Standard, and ensu- res inter operability. The LXI standard defines the communication protocols for instrumentation and data acquisition systems using Ethernet. ........................................................................................... 11 SBench 6 – Powerful Data Acquisition and Analysis Software SB6 SBench 6 – The digitizerNETBOX / generator- NETBOX can be used with Spectrum’s powerful software SBench 6 – a Professional license for the software is already installed in the box. SBench 6 supports all of the stan- dard features of the instrument (see page 13 for more details). DN6 Series 19“ multi-channel LXI/Ethernet systems which can be used either as desktop or rack mount versions. Up to 48 channels Up to 48 analog channels with either BNC or SMA connectors. Full analog interface with programmable in a single chassis. ranges, termination and offset available Powerful cooling fans, a replaceable dust filter and the heavy, well-shielded metal chassis make the DN6 a reliable instrument for industry and research environments. Embedded Server Option This option turns the digitizerNETBOX / generatorNETBOX into a powerful PC that can run your own programs on a small and remote data acquisition system. The Ethernet device is enhanced by more memory, a powerful CPU, a freely accessible internal SSD and a remote software development access method. The enhanced instrument can either run connected to a LAN or it can run totally independently, storing data to the internal SSD. The original remote instrument functionality is fully maintained but running the embedded server option allows the pre-calculation of results inside the unit. Then you can choose to transfer just the information (data or calculated results) that’s required in a client-server based software structure. The embedded server option is ideal for surveillance/logger applications, which can run totally independently for days. When necessary, it can send notification emails or alerts over the LAN, or offload stored data as soon as it’s connected again.